One of the reasons I have a passion for what I do is I get to spend a lot of time in the field. For instance, earlier this spring, I had the opportunity to help some Illinois farmers make the most of planting season by ensuring their seed prescriptions were in order, get their equipment connected with the Climate FieldView™ Drive to capture their planting data, and work with them to upload their historical planting data into their FieldView™ accounts. Now it’s time to help them give their crops every opportunity to grow and thrive to optimize their seed investments. In my area, most farmers and dealers are now focused on fungicide applications – and insecticide applications too, if necessary. While most of them have an established crop protection approach, it’s always exciting when they understand the benefits of adding digital tools – such as FieldView – into the mix. 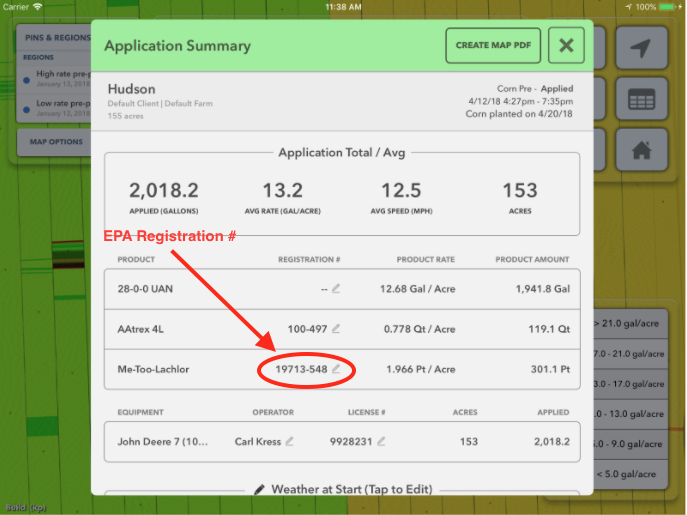 FieldView can be a game changer with farmers and dealers who are looking to enhance crop protection management plans. Field health imagery provides data that enables early detection of crop diseases. Digital field health imagery helps you locate potential challenges in your fields so you can target scouting and take action to address issues. Satellite imagery gives you a full view of your field’s health from above, providing a holistic visual perspective and increasing effectiveness as you track your crops through the season. Application summary reports make it easy to manage and document application data, all in one place. 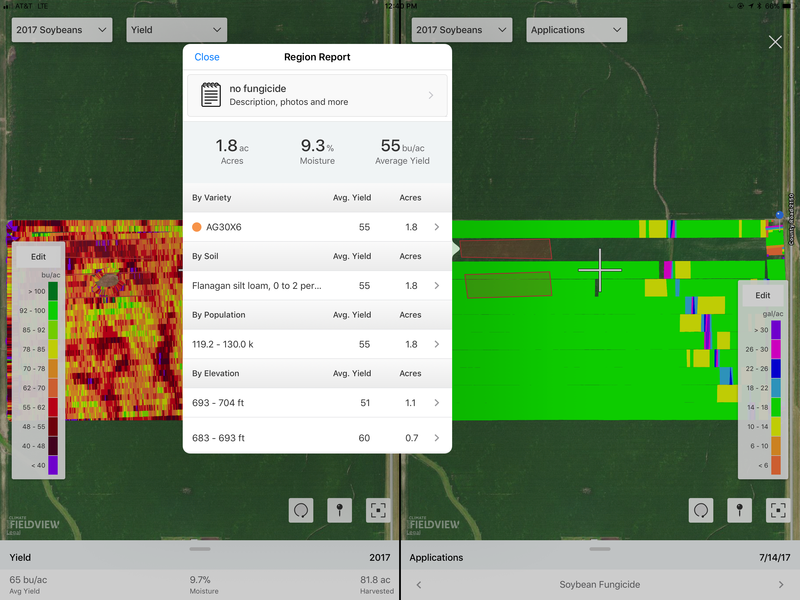 Applications made with FieldView Drive-connected sprayers and the FieldView Cab app enable you to see application data in real time, save this data, and utilize reporting tools to accurately document spray activities through resources such as an application summary report. Farmers I work with love this feature. These application summary reports put all relevant information associated with an application at your fingertips, including attributes commonly required by regulatory documents, such as the EPA registration number for common products. The printable FieldView application summary report provides key application data, all in one easily accessible place, including application map layer, application name, crop and planting date, average speed and acres applied, wind speed and direction, and regulatory information. A single tap of the field report button in the upper right of the map shows the product mix field report. Each product and its rate is reported separately by each unique product mix. The start time for each product mix is in the header above each section in the report. Instant comparisons of yield data vs. application data at harvest help to guide decisions for the coming season. With your data all in one place, you can quickly compare yield data versus application data at harvest. 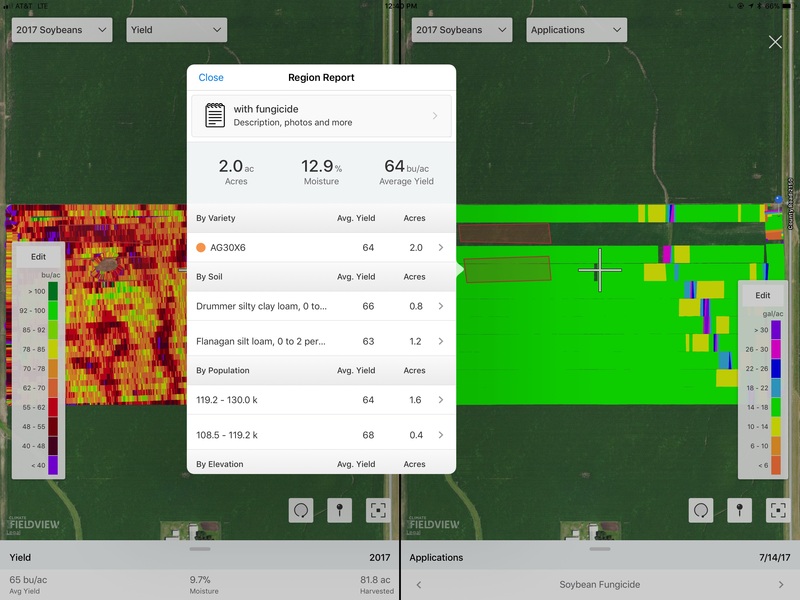 With FieldView, you can look at specific field regions by selecting a portion of the field to run a field region report from a zone to evaluate how your sprayer applications may have impacted yield. My focus is to help farmers and dealers make every investment count, and FieldView provides critical information that really helps hone in on how well an input worked. A field region report by zone can indicate how sprayer applications may have impacted yield in specific areas of your fields. Here is a comparison with and without fungicide applications. During the growing season, you’ll make key decisions that will have a direct impact on your final yield results. I wish you the best of luck during this important time and beyond, and we are always here to help. For more information, contact your Climate FieldView dealer, or the Climate Support Team at (888) 924-7475 or support@climate.com. As a Climate business manager, Sean specializes in helping west central Illinois FieldView dealers and farmers achieve their goals. He graduated with a Bachelor’s Degree in business administration and management from Lindenwood University in St. Louis.